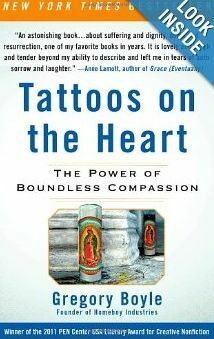 ￼ The HopeWorks staff recently read Gregory Boyle’s Tattoos on the Heart The Power of Boundless Compassion. Anne Lamott declared it to be what we found to be true, “An astonishing book, lovely and tough and tender.” Boyle, founder of Homeboy Industries and Catholic priest who celebrates Mass in probation camps and juvenile halls, offers the reader a look at the compassion, kinship, redemption, and mercy of God. The character of God is demonstrated through the inspiring stories of heartbreak and joy visited upon gang members in Los Angeles who left the life and embraced the employment and relationships found at Homeboy Industries. Through the stories of Scrappy, Chico, and many other gang members, readers witness the largeness of our God. Don’t be afraid to start and stop. Anything worth doing is worth a failed attempt. The strategy for Jesus is not centered in taking the right stand on an issue, but rather standing in the right place—with those relegated to the margins. Sometimes you have to close both eyes to see with the true one. The work of God is slow work. Read Tattoos on the Heart and be inspired to join in the mighty and slow work of God.